When you decide to remodel any part of your house, you want to make sure any remaining part of the design is structurally sound and will support the renovation. Creating a blank canvas that can fit into the new deck design is the first step to remodeling your deck. This could mean completely removing all of your decking material including railings and boards. If you want to keep the existing boards in place, be sure to replace any damaged boards that may become a safety hazard. To extend the deck, you will have to remove the railing and add extra supports to the frame. You will also want to strip your deck of any current design features, such as remaining stain and paint. Remodeling your deck doesn’t have to mean a major construction project. You can create a new outdoor entertaining space with simple updates to your existing deck. If you want to create a new design without altering your deck frame, consider replacing your deck boards with a new material. Composite decking is a great option for outdoor entertaining spaces. It holds up well to heavy foot traffic and won’t splinter or fade like wood does. There is a range of colors available to fit into whatever design style you’re looking for. If you don’t want to replace your deck boards, you update your existing wooden boards. After stripping the wood of the previously applied stain or paint, you can refinish the wood. There are different types of stains that create a different look for your wood. 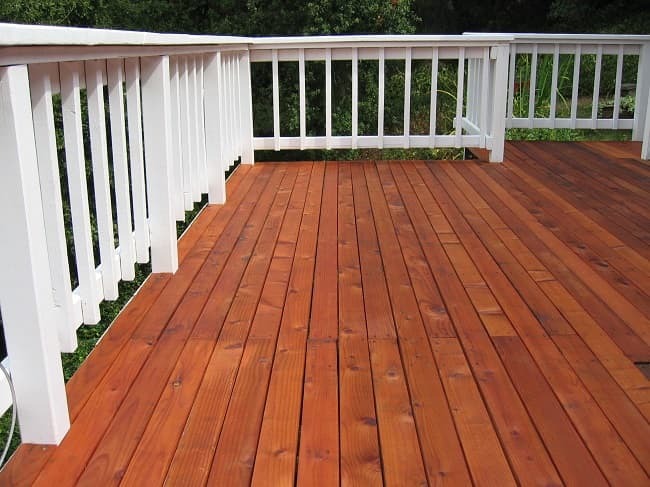 All of them highlight the natural beauty of the wood grain and seal your deck to protect it from weather conditions. If you want a unique color, you can also paint your deck. This would require some extra finishing measures to ensure that the paint will last on your deck. The last simple update to your deck design that can transform your space is to install a new deck railing. Changing out your deck railing is similar to paint an interior wall. It will change the look and feel of your space in the matter of an afternoon. Deck railing designs range from a rustic lattice panel to a sleek and modern glass walls. Your deck renovation may be a little more in depth than a simple update to your materials. If you want to create a larger space for outdoor entertaining, you can extend your deck. This includes installing extra vertical and lateral supports. These can be a standard extension or an addition of bump outs to create smaller separated sections. These spaces are great for larger parties that can cater to different interests. If you have a smaller backyard and don’t have the space to extend your deck out, you can build up your outdoor entertaining space vertically. A raised deck leaves an open space underneath that is perfect for a finished patio. Under deck patios are a very flexible space that is ideal for outdoor entertaining. Because it has a built in roof, a simple drainage system can create a covered patio that can be used in almost any weather condition. You can also use the vertical supports of the deck above as the frame for a screened in porch. The screens create another form of protection from outdoor pests. 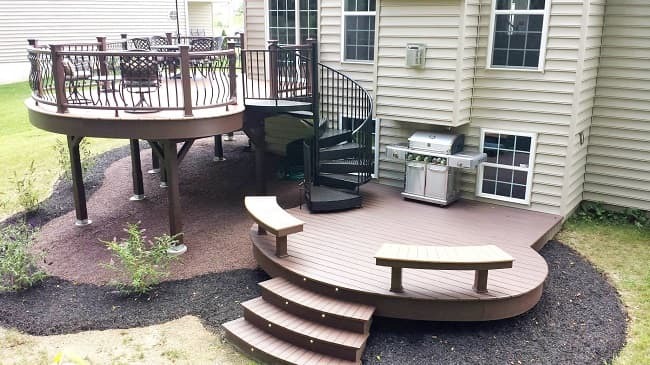 If you want to connect your deck and patio, or just want a new way to reach your backyard from your raised deck, update your deck stairs. There are several deck stair options that fit into different deck designs. The most common design is a traditional staircase. These are typically an all wood design and are a straight staircase like you would find in most homes’ interiors. These fit well with a traditional or rustic home. However, they take up a lot of room and can be bulky in design. In order to ensure the safety of those using the staircase, the individual steps must be a certain depth which creates a very long frame. Another safety concern with these all wood designs is the durability of the material. Wood is an organic material and will break down over time. You will need to go through a deck restoration process every so often to ensure that your stair is structurally sound. Another deck stair option is a spiral staircase leading from your deck the lower level. A spiral stair’s footprint is kept to a small circle in your backyard and maximizes your outdoor space. The first of two designs for your outdoor spiral stair is an Aluminum Powder Coated spiral stair. The already rust prohibitive aluminum staircase goes through a powder coating process that gives it a maintenance free finish. This long lasting design also has the option of being finished with a custom color, giving you a one of a kind design that can fit into any backyard. The second outdoor spiral stair option is a Galvanized Steel spiral stair. This is a cost effective and durable design that is perfect for a small backyard. The steel frame goes through a hot dipped galvanizing process that coats every part of the stair down to the connections of the spindles and handrail. This weather proof finish ensures that your stair will last and stand up to rust which can compromise the safety of your stair. 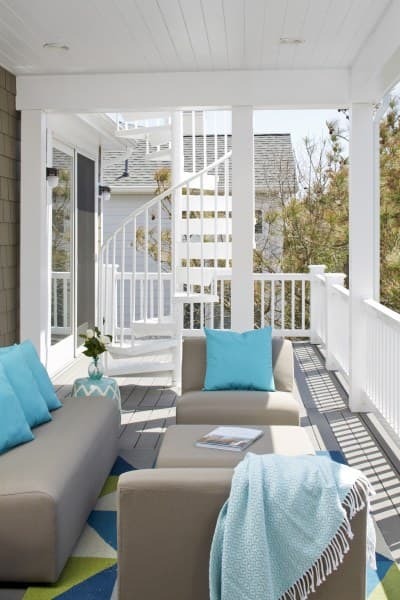 Once you’re done remodeling your deck’s structure, you can fill it with furnishings and give the space a purpose. Outdoor entertaining is one of the number one reasons to remodel your deck. This doesn’t have to be limited to a grill on the side. There are plenty of different ways to decorate your deck to cater to summer parties. The most important thing to remember is to design the deck to fit into your lifestyle. Be sure to fill it with furnishings that you will actually use. Give your space personality through design, just like you would if you were to remodel an interior space. No matter what you decide to use your newly remodeled deck for, there are some materials that will be standard. When looking for outdoor furniture, you want pieces that will last outdoors and still be beautiful. There are several options when it comes to choosing an outdoor fabric. The uses of the fabric range from cushions to curtains that provide shade. The first and most popular is a cotton canvas. This heavy duty fabric is made to last outdoors. A great benefit to this material is that it can easily be dyed or painted to fit your design aesthetic. Another popular fabric is vinyl because of its low maintenance nature. However, it can feel a lot like plastic and can quickly become uncomfortable if used in excess. The frames of outdoor furniture also has a wide range from wicker to wrought iron. Depending on the type of furniture, some materials may work better than others. Paint is always a great solution to customize a previously thrifted piece of furniture. You can refinish an old table or wicker chair and make it look brand new. One of the most popular uses for an outdoor space is an outdoor dining area. These spaces are perfect for summer holidays and dinner parties. The most important furnishings for your outdoor dining area are going to be your table and seating options. The proportion of the table and chairs should fill the space without being too large. If your table is too small, it will make the space feel empty and under designed, no matter how much work was put into it. There are plenty of outdoor table and chair sets with matching pieces. They fit will into traditional design aesthetics that feature symmetry and classic styles. Many of these tables have metal frames and stone tops for a clean finish. The chairs have a matching metal frame and a woven seat. If you want a table and chairs set that fits more into a quaint country charm aesthetic, there are lots of wicker sets on the market. For a design aesthetic highlights eclectic style, you can find coordinating, but not matching, sets. These can be compiled of thrift store finds that are refinished to fit into the same set. If you have chairs that don’t have cushions with them, you can easily make your own with the outdoor fabrics that were previously mentioned. One of the most popular DIY deck and patio projects is to use reclaimed wood to create a farm table that will last outside. These giant tables are the perfect pieces for large gatherings. They are paired with matching benches that provide ample seating. Outdoor kitchens have a few different furnishings than the dining areas. While many people may just have a grill on the side of their deck, an outdoor kitchen features counter space, food storage, and sometimes even a full oven. The lights need to be a little bit brighter than other outdoor applications because of the extra hazards that come with a kitchen. If you want both of these applications to be used in one deck design, under deck patios are great way to separate them. It keeps any excess smoke away from guests’ conversations while still keeping the host or hostess outdoors with their party. An outdoor living room has been growing in popularity recently. This deck design idea takes the standard furnishings from interior design and alters them to fit into your outdoor space. This communal area is perfect for a relaxing night with friends on your newly remodeled deck. Because of the nature of an outdoor living room, you want to make sure comfortable seating is always available for your guests. Outdoor couches and armchairs with cushions are a must for this deck design. The same frames that were used for outdoor dining tables and chairs would apply to these as well. You want something that is going to last outdoors without having to be replaced every summer. Built in pieces are also popular when it comes to creating a unique communal area on your deck. It’s a completely unique piece that you can also design as storage. Many built in pieces have a lift top bench that opens to a storage space for extra cushions or toys. For a true living room feel, you can use a coffee table as the central focus. This not only gives you and your guests a solid and flat surface to use, but also a center point to angle your furniture toward. If you want a more unique centerpiece to your outdoor living room, use an outdoor fire pit in place of a classic fireplace. If you want the coziness of a fire but also the benefits of a table, there are table top fire pits available. A backyard deck is the perfect place for outdoor entertaining in the summer months. You may need to update your deck design to maximize space and have the best outdoor entertaining space possible. Whether you're replacing boards or building a deck addition, remodeling your deck can recreate the entire space. If a multi level deck or finished under deck patio is the right design for you, consider a stylish spiral stair to move from floor to floor. 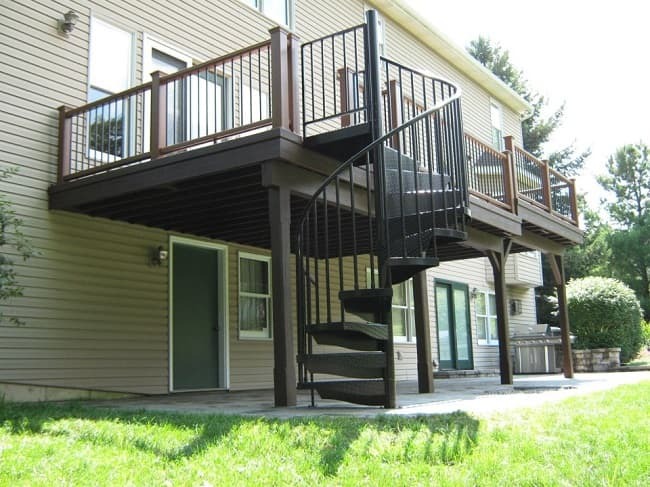 You can further your renovation by replacing your deck railing with a matching railing to your stair. A quick call to one of our consultative designers can get you pricing in five minutes or less!